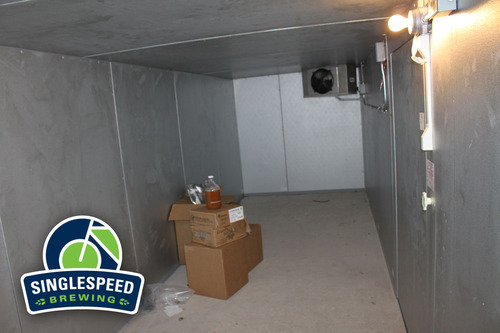 Here is a peek at the inside of the custom-built walk-in cooler that resides in our basement. This took some work as our basement ceiling isn’t the highest, (I think people must have been shorter back in the day?) nor is the floor the most level. After pouring a new concrete pad to use as the floor we were able to squeeze a low ceiling version of a walk-in down here. All that’s chillin’ now are some boxes of hops and a growler of beer courtesy of Toppling Goliath. In a few months this cooler will be packed full of tanks and kegs!